Summary and Definition: The Wampanoag were a confederacy of tribes who were farmers, hunters and fishers. The Wampanoag people lived in Southeastern Massachusetts between Narragansett Bay in Rhode Island to the western end of Cape Cod, including the islands of Nantucket and Martha's Vineyard. The Wampanoag, led by Chief Massasoit, are remembered for the help they gave to the first colonists and for his son Metacom (King Philip). What language did the Wampanoag tribe speak? The Wampanoag tribe spoke in spoke in several related dialects of the Algonquian language family. The meaning of the name 'Wampanoag' is "“People of the First Light” or "Eastern people", in respect of the location of their homelands. The Wampanoag were also known as the Wapenock, Massasoit and "Philip's Indians". What was the lifestyle and culture of the Wampanoag tribe? The Wampanoag were originally a great confederacy of tribes and groups including the Pokanoket and the Mashpee. In the 1500's there were many thousands of Wampanoag people but their numbers were literally decimated by epidemics of devastating diseases such as measles and smallpox brought by the newcomers - the explorers and traders. Some Wampanoag people were even taken a slaves by the traders. Despite the apprehension felt by the Wampanoag towards the newcomers the Pokanoket tribe of the Wampanoag people, led by Chief Massasoit, were responsible for saving the Mayflower Pilgrims from starvation and death during the terrible winter of 1620 - 1621. The Pilgrims of the Plymouth Colony led by Myles Standish, William Brewster, William Bradford and William Bradford pledged peace with Pokanoket. One of the Indians, Tisquantum aka Squanto, was able to speak English. The Wampanoag people taught them farming techniques and helped them to survive in the colony. 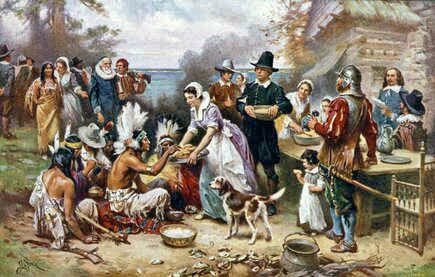 In November 1621 the Pokanoket tribe of the Wampanoag Nation celebrated the "First Thanksgiving" with the Pilgrims. The peace was short lived due to the death of two Wampanoag chiefs during an altercation with Captain Myles Standish and the Native Indians further contact with the colonists. Deteriorating relations resulted in the Pequot War (1634-1638). Praying towns were developed by the Puritans of New England from 1646 to 1675 in an effort to convert the local Native American tribes to Christianity. In 1675, King Philip's War erupted led by Chief Metacom (King Philip) due to the continuous encroachment of white settlers Wampanoag homelands. The Wampanoag were nearly exterminated, only 400 survived the war. Where did the Wampanoag tribe live? The Wampanoag are people of the Northeast Woodland Native American cultural group. The geography of the region in which they lived dictated the lifestyle and culture of the Wampanoag tribe. What did the Wampanoag tribe live in? The Wampanoag tribe lived in temporary shelters during the summer known as Wigwams, aka wetus or wikkums, which are also known as birchbark houses. The word 'wetu' means "house" in the Wampanoag language. Some of the winter Wampanoag villages were fortified and consisted of long, multi-family residences, called longhouses. Wigwams, or wetuash (plural of wetu) are temporary shelters. They are small cone-shaped houses with an arched roof made of wooden frames from saplings (young trees) that are covered with sheets of birchbark. Wide sheets of bark from large, older trees covered the frames of the wetus, which were held in place by ropes or strips of wood. These summer wigwams were covered with woven mats using cattails, tall, stiff plants, growing almost ten feet tall. Many Wampanoag lived in oval-shaped longhouses during the winter. The main difference between the wetu and the longhouse was that the longhouse was a permanent structure, much larger elongated shape. Mats for these winter homes were woven from bulrushes. A longer process than using cattails, but with a hardy result. The mats were used for both the outside and interior of the Wampanoag longhouse and frequently painted black and red. The longhouse villages were surrounded by fencing (palisades) and reinforced with mud. Longhouses were built up to 200 feet long, 20 feet wide and 20 feet high. The longhouses had smoke holes in the roof to allow air and light in and smoke to escape. The smoke hole had a birchbark cover to keep out the rain. The position of the cover could be moved as the direction of the wind changed. What clothes did the Wampanoag wear? The majority of clothes worn by the Wampanoag were made from animal skins or birchbark before Europeans came. These included long breechclouts, leggings, long cloaks and shoulder to waist length mantles. These were made from the skins and fur of deer (buckskin) raccoon, beaver, otter and moose. Wampanoag Women wore wraparound skirts, tunics and cloaks. Moccasins were made of one piece of moose skin with a long tongue and a high collar that could be left up or folded down. The moccasins were greased on the outside for additional waterproofing. Belts were woven from dogbane and other plant fibers that were colored with vegetable dyes. The picture is of Metacom (King Philip) who wears clothes made from trade cloth. His headdress consists of a woven headband and topped with four feathers, a sign of his special status. What food did the Wampanoag tribe eat? The food that the Wampanoag tribe ate included crops they raised consisting of the "three sisters" crops of corn, beans and squash together with Jerusalem artichoke, pumpkin, and zucchini. Meat included deer (venison), black bear, rabbit, grouse, squirrel, duck, geese, muskrat, beaver, otter, raccoon and turkey. Fish included haddock, cod, flounder, mackerel and salmon. Shellfish included oysters, clams, lobsters and scallops. Nuts, berries and grapes were also important food source to the Wampanoag. What weapons did the Wampanoag use? The weapons used by the Wampanoag included war clubs, tomahawks, battle hammers, knives, bows and arrows, spears and axes. Their enemies were the Narragansett tribe. Wampanoag History: What happened to the Wampanoag tribe? The following Wampanoag history timeline details facts, dates and famous landmarks of the people. The Wampanoag timeline explains what happened to the people of their tribe.